On the fourth anniversary of the start of the Five-Day War, the Russian Foreign Ministry fears that Georgia might once again use military force against South Ossetia. Four years after hostilities broke out between Russia and Georgia in South Ossetia, the conflict in the region remains unresolved. The republic’s independence has yet to be widely recognized, and it has not reached any binding agreement on its status with Georgia. According to experts, the vague situation could lead Georgia to once again try to use military force to restore its territorial integrity. 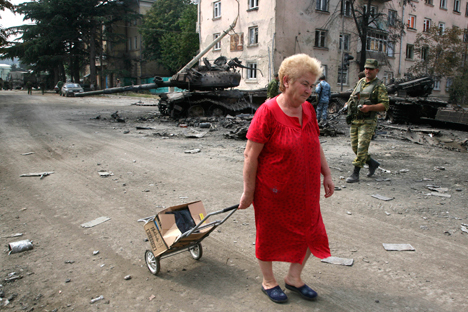 On Aug. 8, 2008, hostilities broke out in South Ossetia. Georgian troops attacked and destroyed part of the capital, Tskhinvali, while Russia moved about 10,000 troops and hundreds of combat vehicles into the region to protect the Ossetians, many of whom have Russian citizenship. After five days of fighting, the Russian forces pushed the Georgian troops out of the region. In late August 2008, Russia recognized the independence of South Ossetia and Abkhazia. In response, Tbilisi severed diplomatic relations with Moscow and declared the two Trans-Caucasus republics to be occupied territories. Major Western powers have been adamant in their position “in defense of the territorial integrity of Georgia”. “Revanchist scenarios and use of force to restore territorial integrity are still alive in the heads of the more zealous politicians in Tbilisi,” said Grigory Karasin, Russian state secretary and deputy foreign minister, on the anniversary of the conflict. Alexander Sokolov, a political scientist and a member of the Public Chamber of the Russian Federation, shares this opinion. “The fact that Georgia continues to arm itself and that it still has not recognized the independence of South Ossetia and Abkhazia shows that this [use of force] is a possibility,” Sokolov said. Sokolov noted that relations between Georgia and South Ossetia are unlikely to normalize until there is a new government in Georgia. The country faces parliamentary elections on Oct. 1 and presidential elections a year later. “Any candidate would be a more acceptable negotiating partner for Russia than the current president, Mikhail Saakashvili,” Sokolov said. Meanwhile, Russia’s Investigative Committee, which is looking to apportion the blame for the conflict, has disclosed new details of the ongoing investigation of the criminal case of the events of the Five-Day War. The committee claims, for example, that the investigation has obtained proof that the Georgian leadership tried to discredit the Russian army during the attack on South Ossetia. “Eyewitness testimony has become available that, before Russian troops entered the city of Gori and other communities on the Georgian border, Ukrainian mercenaries were told to put on Russian army uniforms and were photographed and videoed allegedly committing acts of violence and maraudery against civilians in Georgian villages, all to mislead the people of Georgia and the global community,” according to a committee statement. Meanwhile, more and more Russians are coming out in favor of South Ossetia and another breakaway Georgian republic, Abkhazia, becoming parts of Russia. A poll of more than 1,600 people from 45 Russian regions conducted by the Levada Center on July 20-23 revealed that 35 percent of Russia would support such a move. This number is up 50 percent from last year. The article is based on reporting from Expert, Vzglyad and RIA Novosti.